USA - Bringing unprecedented flexibility and ease of use to a decades-old arena space takes vision, imagination, and the ability to see new possibilities. That’s what Steve Goodling, president and CEO of the Long Beach Convention and Visitors Bureau, brought to the table for the transformation of Long Beach Arena. Working with the nationwide facilities management company SMG, Long Beach set out to bring this vision to reality. Led by Charlie Bierne, the SMG management team assembled a design collaborative including John Sergio Fisher Architects, Theatre Projects Consultants and Jerry Sherman, AIA. To execute the innovative system the design team conceived—and to turn the job around in less than a year—the City of Long Beach selected the entertainment rigging design and manufacturing company J. R. Clancy, Inc. The arena, originally designed as a sports venue for hockey and basketball, had expanded its client base dramatically since it opened in the 1960s. Today it accommodates a much wider range of events: concerts, sporting events, fashion shows, lectures, receptions, dinners, large-scale performances, and more, but its original construction did not permit the kind of flexibility and fast turnarounds its modern uses require. At the heart of the team’s design for the renamed Pacific Ballroom at Long Beach Arena is the largest flying truss and tension grid system in the United States. The one-of-a-kind movable grid system would change the antiquated arena into a grand ballroom or a series of smaller spaces, as clients and events required. "What we’ve created is essentially a technical ceiling," said Michael Ferguson, project director with Theatre Projects Consultants. "It’s a large, metal structure that weighs tens of thousands of pounds. It’s the only tension grid in the world that can fly up and down. A surrounding curtain wall comes down and creates the side walls." "With a full truss system and curtains, you have the ability to have a full house, a third house, or a two-thirds house," said Bierne, who serves as general manager of Long Beach Convention and Entertainment Center. 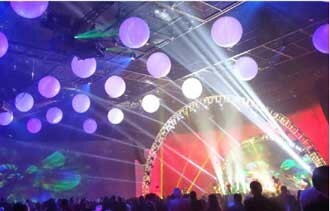 "We can do receptions, we can do pop concerts, we can do auto shows with individual lights on the autos. We have lights installed, and sound installed. This breathes new life into an existing space." "The people at SMG really worked closely with us to make this transition, even scheduling events around our installation schedule," said Mike Murphy, J. R. Clancy president. "They knew the benefits this system would bring to them, so they were willing to accommodate our needs for access to the arena." Brett Cooper, contract project manager with J. R. Clancy, moved to Long Beach and served as on-site project management for all of the trades in the arena space. In addition to serving as the lead contractor on the project, J. R. Clancy provided the high-capacity hoists and the control system for this innovative grid configuration, and also installed all the lighting and sound infrastructure. Clark-Reder Engineering, Inc., designed the structural steel for the building modifications to support the new tension grid and the additional load various productions will require. The three-piece traveling tension grid contains more than $1.6 million in fully integrated LED lighting instruments, hanging over the 45,000-square-foot convention floor. "It’s a flying catwalk system," said Bridget Cox, director of project management for J. R. Clancy. "The tension grid panels are flown in with three big hoists—and each of the hoists has a capacity of 84,000 pounds. These allow the tension grid to travel from floor level to a storage position sixty feet above the floor. They can use the grid for personnel access to hang lighting, mount speakers, and have a fully flexible, versatile space." In addition to the capacity for lighting and sound equipment, there were also perimeter and divider curtains provided that help configure the arena space into smaller event areas. "The perimeter curtains are motorized brail," said Cox. "Eight of these perimeter curtains form a complete oval around the floor space. The trusses have self-climbing hoists inside of them, so the operator can bring the curtain up, and the trusses can fly up as well." A two-person skyclimber above the grid allows personnel to access the assembly by riding down to it. Walkways join the grid sections together, allowing as many as 15 people to be on the grid itself—should a touring show bring additional equipment to hang from the grid, for example. The entire system can be controlled from a simple interface developed by J. R. Clancy specifically for this project. Using the wireless pendant controller, an operator can raise and lower the grid sections from anywhere in the ballroom. "We incorporated a true emergency stop into a wireless automation system, which requires a higher level of functional safety," said Tom Zorn, controls hardware developer at J. R. Clancy. Zorn worked closely with Larry Eschelbacher, J. R. Clancy director of engineering, on the development of the control system. "It’s built on the Siemens Functional Safety Model, a higher level of program that is robust enough to prevent interference from other signals in the room. The control system is used pre-show to set the equipment in a specified position, and will not be used during a performance." Changeovers that once required a large crew can now be done in a matter of minutes—raising or lowering the ceiling, lowering the draperies, and changing the lighting to create the desired atmosphere for the next event. The Long Beach Post reports that this repurposing of the Long Beach Arena cost "a fraction of what it would have been to build an entirely new ballroom structure. The return on investment, then, will be huge."